3rd of the World Supersport Championship. 5 victories. 3rd of the World Supersport Championship. Jules Cluzel is a sportsman since his youngest age. For his first participation into a high-level championship into the 125cc French Championship, he received a wild-card for the French GP 2005. After some seasons in Grand Prix, Jules knew his first 250cc GP podium in 2009 on Qatar circuit. The year after in Moto2 category, he often fought for the top 5 and ended the season in 7th position with one victory (English GP). For his first season in World Supersport Championship, Jules finished 2nd at the end of the season with 4 victories and 4 podiums on 13 races. 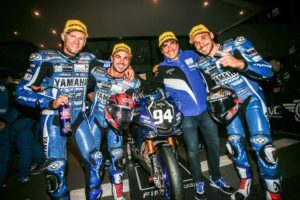 Before beginning 2019, Jules is the french recordman of victory in WorldSSP with 17 triumphs.